Giotto's Campanile (or bell-tower) is the name given to the actual bell-tower of the Duomo of Florence. 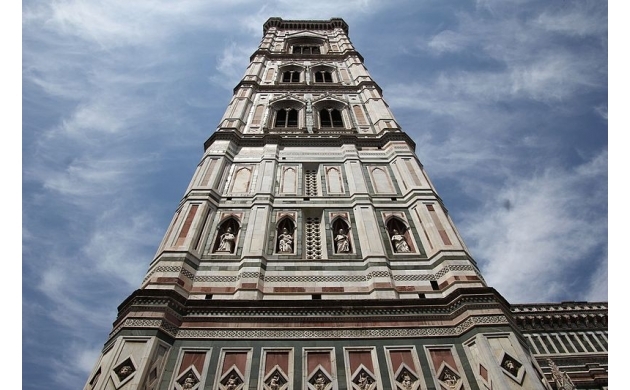 It is a beautiful construction, 85 meters high and split into 5 levels, decorated in white, green, and red marble, which is typical of Florentine churches of that epoch. The splendor of the bell-tower itself is considered by all historians of art and architecture to be a genius (and costly) invention of Giotto, created as more of a decorative monument rather than a functional one. But what one discovers upon closer examination of the story of the construction of the Campanile is something that is actually much more important. 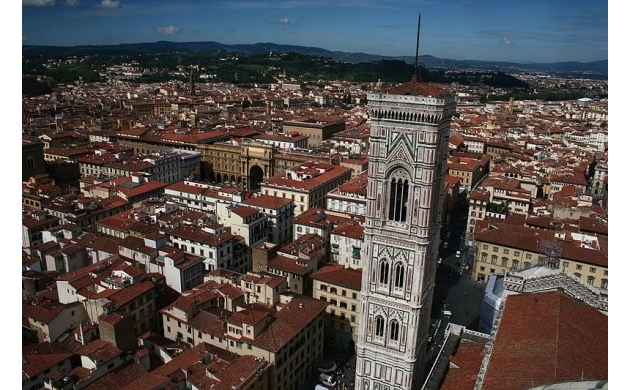 Every level of the bell-tower tells a story about the Florentine artists that worked on it. At first glance, the initial peculiarity that one notes is the stark difference between the first two levels of the construction (which lack entrances for light and are instead brimming with classical and geometric motifs) and the final three levels (where windows appear on a slender and elegant structure that recalls more of a gothic rather than classical style). What we are seeing is the work of the three different artists who, after 1298 (the year in which Arnolfo di Cambio laid the foundations for the church and the bell-tower), followed him in the job of finishing the construction of this fantastic building. With the death of Arnolfo di Cambio in 1310 the Opera del Duomo found itself without a capable hand to guide the further construction of the church (or even to fully comprehend the plans). This work eventually fell to Giotto, who was initially not interested in the Duomo itself, but rather preferred to focus on the Campanile, where he could express his pure creativity without being constrained by other artists. Giotto wanted to build a bell-tower that was 115 meters tall, much taller than Brunelleschi's dome itself, and placed on a base of only 15 meters. This titanic job however lacked adequate planning, which naturally caused numerous problems for the architects that followed Giotto - but who were nonetheless able to reach only (in a manner of speaking) 85 meters of the planned height. Giotto started the bell-tower in 1334 but died only three years later, just after finishing the first level of the construction. His artistic inclinations ended up slowing down the building of the tower, as the construction itself had to be done contemporaneously with his external coating. This inevitably caused many delays. The bell-tower thus ended up being the final unfinished work of Giotto. Andrea Pisano, who had already worked on the bronze doors of the Baptistry, succeeded Giotto. His first job was to resolve the problem of instability in the construction, which he achieved by adding some internal support structures within the bell-tower itself. But Andrea Pisano also faithfully followed the work of his predecessor, using hexagonal base panels that were based on the designs that Giotto passed down while on his death bed. Meanwhile, in regards to the construction of the second and third levels, Pisano opted to make some substantial modifications to the original plan. For instance, the second phase which had 16 niches was filled with statues of the prophets, the sibyls and St. John the Baptist. This was in fact a significant change to Giotto's original plan which called only for bas-reliefs. In this case, as was the same with Giotto, the artist's preferences trumped those of the builder's: Pisano in fact entrusted the creation of the statues to the most illustrious Florentine sculptors. This was a choice that ultimately resulted in a delay in filling the niches well beyond the completion of the tower itself, such that some of the sculptures found there are in fact masterpieces of Renaissance era artists. Among works by Nanni di Bartolo, Andrea Pisano, Donatello, and Luca Della Robbia - the one that really stands out is the celebrated Abacuc (which the Florentines call "lo Zuccone" or "the big pumpkin" because of its bald head), a figure of immense and tormented spirituality, done between 1423 and 1436 by Donatello. With the death of Pisano in 1348 and the Black Plague which hit Florence the same year, the work on the bell-tower was suspended and only continued ten years later. In 1359 it was the turn of Francesco Talenti, who put his gothic stamp on the highest part of the bell-tower. Here the sculptures and massive marble slabs give way to enormous vertical windows which open up the walls, inundating the structure with natural light. The windows on the highest levels of the bell-tower are in fact an invention of Talenti that were not envisioned in the classical plans of Giotto. These added architectural details give the bell-tower its elegant gothic touch. Another departure from Giotto's original plan is found at the very top of the bell-tower: the terrace. Above the last level there was actually built a platform, while Giotto had originally envisioned a cusp. In 1369 Talenti died, but Giotto's bell-tower was by then complete. 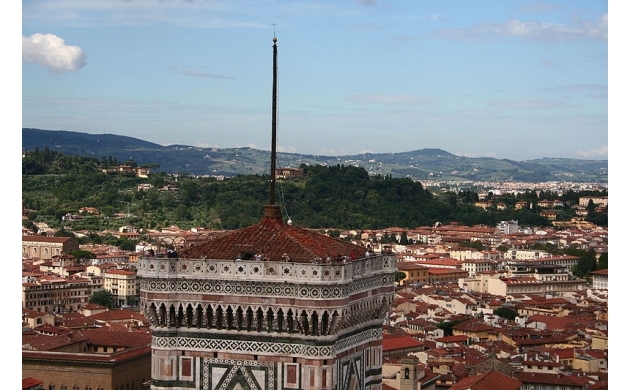 It had taken nearly 30 years to finish the construction, and the only thing to do now is to climb the nearly 400 stairs and see with your own eyes what it means to observe Florence from its center at over 85 meters in the air! 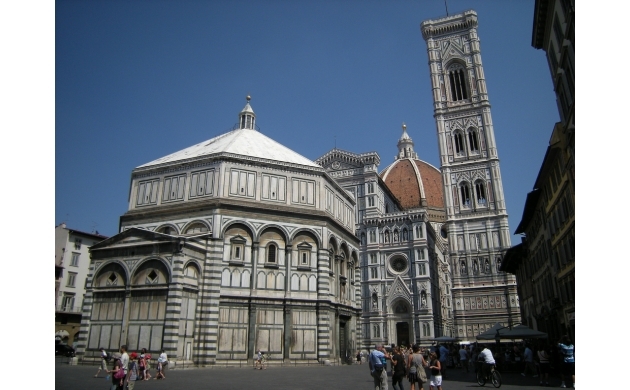 Today it is possible to climb to the top of the Campanile every day between 8:30 and 19:30 by buying a 10 euro ticket that also allows you to visit all of the buildings associated with the Opera del Duomo di Firenze.